Let the kids burn off some energy on the football field at Chateau de l'Eperviere campsite. What's the best way to see the park? Hire a bicycle and tour the park at your own pace. Need a little pampering? try the Spa at Chateau de l'Eperviere campsite. Want to have a closer look at Chateau de l'Eperviere campsite? If you think Chateau de l'Eperviere campsite in Gigny-sur-Saône, Burgundy is the holiday park you, why not have a closer look, and check out prices and availability. Chateau de l'Eperviere campsite family holiday park has 160 pitches. Eurocamp have family holidays parks all around Europe. 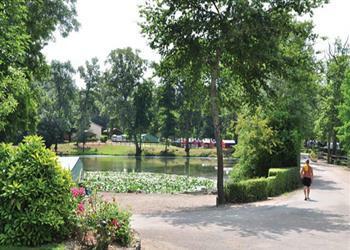 Chateau de l'Eperviere campsite (BU011) is just one of the family holiday parks in Gigny-sur-Saône, Burgundy, France. Have a look for other holiday parks in France. You can also see what other people though with the reviews of Chateau de l'Eperviere campsite. These are the reviews for Chateau de l'Eperviere campsite. There are 145 reviews. Site seems to mainly accommodate short stay transit travellers. Creates v. Unsettling and unrelaxed atmosphere. Our pitch (95) remained in deep shade for all but 20 minutes in mid afternoon so we were unable to make any use of the decking, which usually forms an enjoyable part of our holiday. The decking became extremely slippery when wet and the deep shade and deposits from the trees added to the hazard. My wife fell victim to this treacherous surface on sunday 13/9/15 at approx. 7.25 am, and the holiday that we had planned was then effectively at an end. Everything was great. we had a lovely time. Strange park - many people staying for only one night always meant many vehicles coming and going giving a strange ambiance. Facilities were fine although the bar area was small and the wi fi connection poor. Although there was fishing access to the ;lake is not easy apart from a few places, one of which means walking across someone's pitch. Used site as a stopover for travelling further south. The courier who showed us in was genuinely friendly and helpful. The accommodation was absolutely sparkling clean, which I am sure is no mean feat judging the old age of the accommodation so credit where credit is due. The restrauant onsite was good and not too pricey either. We bought local beer and wine in the onsite shop which were both delicious. Overall a top little stopover. The area is calm and relaxing, the pools were nice too. Probably for us just a little too quiet. This is a lovely campsite for a stop over. we were only there for the night, but happily enjoyed the lovely pool and some good take away. in fairness it would be a nice place to spend a longer holiday, but I suspect many of the other guests would be passing through so not if you / your kids like to make friendships on holiday. mobile home was well equipped and our bed was comfortable. when we arrived the temperatures were in the mid 30's and the single fan in the mobile home was totally ineffective - it was like an oven in there. if we'd been staying more than one night I would have needed additional fans/aircon to make full use of the mobile home. A wonderful parc in a beautiful, quiet, setting. Superb for a stop over staff great and accommodation was like it was new still clean and fresh. Difficult to review this parc as it was just a pit stop over night and so we didn't use the facilities or explore it enough. Top class and total quality. We had a really great time. Our children loved it. Just used as a stopover but wonderful setting. Quiet area. Convenient stop over or longer. Lots to do in area or just cycle to river path and have cafe at barrage! Another enjoyable and relaxing holiday with eurocamp. Lots to see and do in a delightful area. A very nice site. We had 2 very pleasant overnight stays. Probably the best campsite so far great location and everyone involved from the campsite staff to couriers were excellent. Good location excellent resturant but busy with a lot of short stays. This was a stop-off on our way home and clearly the campsite was mostly used in this way. it was also closest to beaune which we wished to visit. We arrived at 2.45pm. there was a note in the ec hut with a list of names of new arrivals and their units. and a tear off camp map. it asked us to site ourselves - great, no more waiting around for 15 minutes with a queue developing. however, no-one then came to welcome us for 48 hours! not at all good, should be addressed as a matter of urgency. good idea, very badly carried through and could affected our stay. Nice park, ideal for a stopover on the way south or back, which is what we did. Fantastic restaurant!!! A really nice parc with just the right amount of facilities to have a relaxing time. Excellent site and your staff were very helpful and when we became ill with gastro entiritus sian did everything she could to sort out finding us accommodation and rebooked our eurotunnel trip as we were too poorly to travel on the day of our departure, and she made sure we were comfortable.all the gigirls were great. My holiday was spoilt due to ill health of my wife for the whole of our visit.matters did not help in that with weather into the 30s the fridge door would not close properly couriers tried to help but could not get anybody to deal with the matter as the person was on a course and not back till the 16th june. The result was food being wasted due to temperature. Convenient stopover. lovely small site, though seemed cut off from surroundings. Accommodation a bit lacking. The only point that I would make is that there is too few bins for the dog waste. Very good site. Good facilities. Indoor pool small. Take-away excellent. A nice site built around a chateau. Rather out in the sticks with no public transport. Lovely walks along the river but with few stopping places to sit or relax and enjoy the view. Very quiet rural area. We booked our holiday at the last minute and had never been to a eurocamp before. we were pleasantly surprised to find the setting delightful, staff friendly and helpful, accommodation - clean and with good equipment. Lovely, quiet and small secluded family campsite in the french countryside. lovely parc, not much to do on rainy days. Great indoor and outdoor pool. We had to complain to bar staff as some teenagers we using the indoor pool ona rainy day a little dangerously, and the pool is small and fills up quickly when bad weather arrives. Nice shop and cafe area. In the middle of nowhere, must use a car. Lovely stop-over place. Clean, well appointed and a v/good tent with all equipment in place. A wonderful holiday, let down a bit by the weather. This is an lovely campsite,in flat country side,with great cycling. The site was peaceful and well maintained. Shop not open, pools not open, park is in the middle of nothing, had to travel a lot to access anything. Shop was closed,would have liked to know that before booking and probably would not have gone. Electricity not reliable kept shorting out. Some sockets didn't work, microwave had to be moved. Butane gs used instead of propane and was no good in the cold mornings. Euro amp should know this. My daughter and her family were there too and they couldn't get hot water or even boil a kettle in the mornings. Poor do really. Fabulous accommodation for overnight stay just a bit muddy around the units and play area after overnight rain. Loved the pool - perfect apart from the mud! We have taken this type of tenting at this parc on a number of occasions over the years and were disappointed to find that it is still being used as an overnight stop as people travel both north and south. it is no longer a holiday park for those who wish to holiday in this area. Lovely site in a beautiful area, with excellent weather. We stayed in a static home which was very hot and stuffy. The walls were like paper and the beds seemed to creek loudly at night and we're uncomfortable. I ended up with back ache by the morning. There was 7 of us, 4 adults, 2 toddlers and a baby and so we found it quite compact. The blankets also made my skin itch. There was only one toilet roll for everyone too. . on the plus side, we had some lovely home made pizzas from the little take away restaurant. In my opinion, I would not want to stay at eurocamp again and would rather stay in a hotel. Great stop off on the way and back to from southern france. Nice quiet relaxing site. thoroughly enjoyed it there. One of the nicest parcs I have been to. Lovely pitches, lots of space. Restaurant excellent and great pool complex. Wish we had longer there! We were here for an overnight stop en route home. Kids enjoyed the pool and the take away boef bourginon was fantastic. Would like to return here for a longer time in the future. The site itself is a nice quiet one. the pools are small though and the sauna and jacuzzi were only open from 2pm until 5pm. the restaurant has a limited menu which was overpriced. the pizza takeaway service was expensive although it was nice to have them freshly made in front of you. the mobile homes are not positioned well, there is little privacy and they are very tired and dated. ours whilst was clean, had 2 bulbs not working and the boiler leaked onto the worksurface. we did report this and can't believe previous users hadn't as there was a build up of limescale on the worksurface indicating that users would surely notice it. we paid over 500 uk pounds for 3 nights which was hugely overpriced, but a change of our holiday destination meant that we had little choice over where we booked. we weren't advised that we would have to recycle our waste and were provided only with one black bin. prior notice would have meant that we would have been more careful. We love this camp for a short stay before with travel south. Great for a short stay, pretty and do the best wine ever! tent was immaculate and pizzas didn't let us down either. Great campsite very quiet, well looked after, facilities were great, lovely pools, great washing and washing up areas. Nice bar, shop, excellent pizza restaurant and take away. The band we saw was great. Could have done with more entertainment. Great stay and very relaxing. Great stopover site. Would love to stay for longer at this site! Fantastic park, facilities were excellent setting was lovely. Perfect for the children. We had a 3 night stay to break the journey to the south of france. Our first booking with eurocamp. Perfect site for our children - free wi-fi in the courtyard/bar area & children's play area close to our mobile home. We also hired a bike for 1/2 day for our 9 year old to ride around the campsite. Indoor pool an advantage when the weather was a bit cool one day. We have stayed at castel's campsites in france before and this site met all our expectations of a this 4 & 5 star chain. Stayed for a stopover and then for 3 days. Parc is quiet, few facilities but pretty area and great pizzas. Great for cycling out. Visit beaune, it is really pretty. A great holiday, the parc was amazing and clean. Overall a great holiday. A lovely site in a great part of burgundy. Great but for the weather!! Peaceful site, but very much a transit site for caravans etc. Bank holiday weekend meant a lovely quiet site was full. Site office very helpful. No shops or facilities in village but that was its charm. We used this parc as an overnight stop to break the journey to the south coast. Lovely spacious wooded site with lake and lily pond. Interesting surrounding area to explore. We stayed for six nights on this site. It is well managed and located to give access to interesting towns in the area. Beaune, challons and macon well worth a visit. Pleasing village scenery around and the river soane came as a surprise by its width and riverside access. Chateau restaurant poor with awful service. Lots of people cycling around the site, no use of bell to warn pedestrians they were passing. Little shade.take away good. Only a stop over but very nice site in good position with lovely atmosphere. Just a perfect little site. Safari tents are amazing. Will certainly be back next year. Pool great for young children. Park was quiet and safe feeling. We (mature couple) stayed for 11 nights in june 2014. The site is situated in lovely rural burgandy and is about 20 minutes drive from the autoroute so was used as a stop over for 1 or 2 nights en route to the south which is a shame for those missing out on site and area.we had very hot weather throughout our stay which helped us enjoy our holiday and site seeing trips very much.there is a lake lac de laives with a small beach & cafe/ restaurant about a 20 minutes by car near the lovely village of laives . a bit further away past tournus there is a beautiful walking and cycling area la truchere. Boat trips leave from here at 3pm and there are also cafes and restaurants. We also enjoyed the chateau with its lovely gardens at cormatin and the towns of cluny with its imposing abbey, the old centres of beaune & dijon. louhans was worth a visit too. One night as part of an excellent tour which included over 3000 miles of travel and staying with 3 lots of friends.eurocamp provide fantastic flexibility for this type of holiday. Park was pretty and well kept with nice pool complex, although they were both freezing. Tent was filthy, including biscuits in our daughter's cot and cheerios down the sides of her high chair. Convenient location. Weather & local facilities poor, but was late in season. Stayed 3 nights with view to cycling. There is an excellent cycle path not very far away which we found by accident last time - the reps knew nothing about it! it is a long way to a supermarket, the closest being across the river, again found by accident. Good walking and cycling along river. Lack of information about these and other things in the area. Enjoyed our stay but only because we already knew the area. We enjoyed the holiday very much and did a lot in those 2 weeks.we spent time on the beach time by the pool we had a meal on the front at st tropez we had a day in paris we swum in a lake we bought the children a blow up boat they made friends with other children they improved their french.we returned home tired but with a lot of good memory's . We wanted a short break in peaceful surroundings, good weather, lovely scenery, good food and wine and interesting places to visit. this ticked all the boxes. The stopover on our way back was just what we needed and this parc was peaceful and immaculate. Lovely friendly well run parc. perfect for our stopover! Only stayed at this park as a stopover to and from frejus. But found the couriers excellent and thought the park was ideally suited for younger families. Fantastic site, pity about the sub standard and filthy accomodation. Real pity the courier was not to give basic information such as local supermarket opening hours. Great site for stopover en route to provence but also a lovely quiet site for longer stay. After an excellent eurocamp holiday last year, at les grottes de roffy in the dordogne, I was keen to book another in a different part of france. I spoke at some length to one of your ever-helpful advisors and opted for chateau de l'eperviere, which seemed to offer much the same standard as last year. however, I feel strongly that the parc was oversold in your brochure. firstly, although there were many independent campers there, most of the eurocampers were passing through, so the atmosphere was one of a transit camp: unsettled and a bit unfriendly. the pool was far too small for the size of the parc and was always crowded with kids at all times of day and thus not very suitable for a toddler. I accept that there was a paddling pool for the little ones, but it was away from the main pool and rather old and unloved. secondly, I had booked what I assumed was the exact same accommodation as last year - a 2 bed horizon. Last year we were delighted with our spotlessly clean, bright and airy accommodation. In this case, we found the cabin to be much less spacious and less well laid out - it was cramped and lacking in storage space and smaller than last year. For eg, in the double bedroom there was barely room to move around the bed and the doorway wasn't wide enough for my partner's shoulders to go through face on! even the decking area was smaller so that the table and chairs left little room for anything else. I daresay the cabin was an older model than last year's, and it was certainly showing its age. am I right to assume that, because most of your visitors are passing through this parc, you do not consider it necessary to provide the same standard of accommodation as elsewhere? we were very disappointed. frustratingly, we noticed several brand new keycamp cabins standing empty for our entire stay. I gather that you and they are now officially one company so I don't understand why we couldn't have been assigned one of these better cabins for our stay, rather than our rather grotty eurocamp one. Excellent holiday. couldn't be faulted. staff excellent and helpful and caring. We shall return next year for a month. A great site for a stopover to the south. The parc was superb. However, you are fortunate indeed to have sam as the lead courier. Courteous, caring, considerate, extremely capable and demonstrating an impressive comprehension of corporate responsibility, he is an absolute testament to your company and we were impressed with him beyond words. I believe that he will be working with you again next year, but my recommendation is that you use his skills, care and leadership to inspire other couriers to achieve the same excellent high standards and attention to detail that he posseses. He is a credit to you, and a credit to your company. We love eurocamp, all it stands for, the freedom, the opportunities and the value. I eurocamped throughout my childhood, and this year my one year old son had his first night in a eurocamp tent. Long may the traditions continue, and you'll have me and my family as customers for as long as we can walk / drive! A great holiday. We will almost definitely return at some point in the future. Nice site in a lovely area. Good if slightly expensive restaurant. Only criticism is the noise at night of people doing washing up as late as midnight. I was disappointed that eurocamp failed to notify us about the floods on camp,instead of grass on our site we had gravel.ithink we should have had the option of changing sites. Le Bois Masson - Rue Des Sables, 85160 St Jean De Monts.